Department of Commerce Secretary Wilbur Ross is urging President Trump to impose tough tariffs on aluminum and steel imports to protect American industries and increase domestic production in the latest effort to fulfill the “America First” economic nationalist agenda of the White House. On Friday, Ross announced multiple recommendations to Trump on how to deal with the massive amount of imported aluminum and steel flooding the U.S. market. Ross said in a statement that the steel tariffs are designed to increase domestic steel production to 80 percent from its current rate of 73 percent. “Each of the three proposals is intended to raise production of aluminum from the present 48% average capacity to 80%, a level that would provide the industry with long-term viability,” the Commerce Department wrote in a statement. 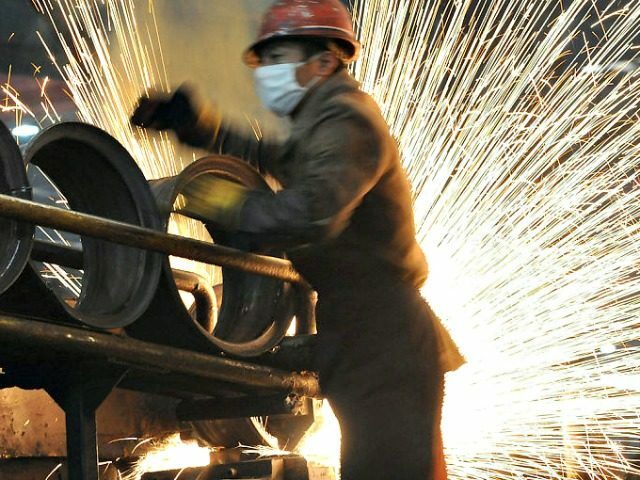 The trade recommendations by Ross are included in a report which found that China produces as much steel in one month as the U.S. produces in one year, as there are 169 antidumping and countervailing orders currently in place on steel. The Commerce Department also found that the importation of aluminum to the U.S. has been coupled with a 58 percent decline in aluminum industry employment in the U.S. between 2013 to 2016. Ross’s fair trade requests are part of a Trump administration effort to protect American industries from unfair trade practices and the detriments of free trade agreements like NAFTA, which have led to the gutting of working and middle-class American jobs. As Breitbart News reported, Americans are increasingly supportive of tariffs in order to protect the U.S. and its workers from globalization. According to Rasmussen Reports, roughly 50 percent of Americans said the federal government should “place tariffs on goods from countries that pay very low wages to their workers,” as opposed to only 26 percent of Americans who said tariffs should not be imposed on foreign countries. About 24 percent of Americans said they were “not sure” if the government should use tariffs to protect American industries. Additionally, a plurality of Americans, about 44 percent, said the federal government is not doing “enough” to protect U.S. manufacturers and businesses from foreign competition” from globalization which has been exacerbated by endless multinational free trade agreements supported by the Democratic and Republican party establishments. Already, Trump’s announcement of a 30 percent tariff on solar imports has resulted in one Chinese solar company planning to build a manufacturing plant in the U.S., as Breitbart News reported.